Auguste Dupin in "The Purloined Letter"
Le Chevalier C. Auguste Dupin [oɡyst dypɛ̃] is a fictional character created by Edgar Allan Poe. Dupin made his first appearance in Poe's "The Murders in the Rue Morgue" (1841), widely considered the first detective fiction story. He reappears in "The Mystery of Marie Rogêt" (1842) and "The Purloined Letter" (1844). Dupin is not a professional detective and his motivations for solving the mysteries change throughout the three stories. Using what Poe termed "ratiocination", Dupin combines his considerable intellect with creative imagination, even putting himself in the mind of the criminal. His talents are strong enough that he appears able to read the mind of his companion, the unnamed narrator of all three stories. Poe created the Dupin character before the word detective had been coined. 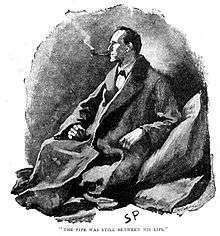 The character laid the groundwork for fictitious detectives to come, including Sherlock Holmes, and established most of the common elements of the detective fiction genre. Dupin is from what was once a wealthy family, but "by a variety of untoward events" has been reduced to more humble circumstances, and contents himself only with the basic necessities of life. He now lives in Paris with his close friend, the anonymous narrator of the stories. The two met by accident while both were searching for "the same rare and very remarkable volume" in an obscure library. This scene, the two characters searching for a hidden text, serves as a metaphor for detection. They promptly move to an old manor located in Faubourg Saint-Germain. For hobbies, Dupin is "fond" of enigmas, conundrums, and hieroglyphics. He bears the title Chevalier, meaning that he is a knight in the Légion d'honneur. Dupin shares some features with the later gentleman detective, a character type that became common in the Golden Age of Detective Fiction. He is acquainted with police prefect "G", who appears in all three stories seeking his counsel. In "The Murders in the Rue Morgue", Dupin investigates the murder of a mother and daughter in Paris. He investigates another murder in "The Mystery of Marie Rogêt". This story was based on the true story of Mary Rogers, a saleswoman at a cigar store in Manhattan whose body was found floating in the Hudson River in 1841. 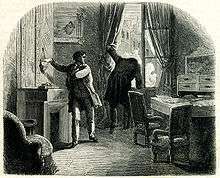 Dupin's final appearance, in "The Purloined Letter", features an investigation of a letter stolen from the French queen. Poe called this story "perhaps, the best of my tales of ratiocination". Throughout the three stories, Dupin travels through three distinct settings. In "The Murders in the Rue Morgue", he travels through city streets; in "The Mystery of Marie Rogêt", he is in the wide outdoors; in "The Purloined Letter", he is in an enclosed private space. Dupin is not actually a professional detective, and his motivations change through his appearances. In "The Murders in the Rue Morgue", he investigates the murders for his personal amusement, and to prove the innocence of a falsely accused man. He refuses a financial reward. However, in "The Purloined Letter", Dupin purposefully pursues a financial reward. While discussing Dupin's method in the light of Charles Sanders Peirce's logic of making good guesses or abductive reasoning, Nancy Harrowitz first quotes Poe's definition of analysis and then shows how "Poe the semiotician is running the gamut of possibilities here—inferences, reasoning backwards, visual, sensual and aural signs, reading faces. Playing cards with the man would have been an interesting experience." There is considerable controversy about the philosophical nature of Dupin's method. According to biographer Joseph Krutch, Dupin is portrayed as a dehumanized thinking machine, a man whose sole interest is in pure logic. However, Krutch has been accused elsewhere of a "lazy reading" of Poe. According to Krutch, Dupin's deductive prowess is first exhibited when he appears to read the narrator's mind by rationally tracing his train of thought for the previous fifteen minutes. He employs what he terms "ratiocination". Dupin's method is to identify with the criminal and put himself in his mind. By knowing everything that the criminal knows, he can solve any crime. His attitude towards life seems to portray him as a snob who feels that due to his aptitude normal human interaction and relationships are beneath him. In this method, he combines his scientific logic with artistic imagination. As an observer, he pays special attention to what is unintended, such as hesitation, eagerness or a casual or inadvertent word. Dupin's method also emphasizes the importance of reading and writing: many of his clues come from newspapers or written reports from the Prefect. This device also engages the reader, who follows along by reading the clues himself or herself. Poe may have gotten the last name "Dupin" from a character in a series of stories first published Burton's Gentleman's Magazine in 1828 called "Unpublished passages in the Life of Vidocq, the French Minister of Police". The name also implies "duping" or deception, a skill Dupin shows off in "The Purloined Letter." Detective fiction, however, had no real precedent and the word detective had not yet been coined when Poe first introduced Dupin. The closest example in fiction is Voltaire's Zadig (1748), in which the main character performs similar feats of analysis, themselves borrowed from The Three Princes of Serendip, an Italian rendition of Amir Khusrau's Hasht Bihisht. In writing the series of Dupin tales, Poe capitalized on contemporary popular interest. His use of an orangutan in "The Murders in the Rue Morgue" was inspired by the popular reaction to an orangutan that had been on display at the Masonic Hall in Philadelphia in July 1839. In "The Mystery of Mary Rogêt", he used a true story that had become of national interest. Sherlock Holmes was one of several fictional detectives influenced by Dupin. C. Auguste Dupin is generally acknowledged as the first detective in fiction. The character served as the prototype for many that were created later, including Sherlock Holmes by Arthur Conan Doyle and Hercule Poirot by Agatha Christie. Conan Doyle once wrote, "Each [of Poe's detective stories] is a root from which a whole literature has developed... Where was the detective story until Poe breathed the breath of life into it?" Many tropes that would later become commonplace in detective fiction first appeared in Poe's stories: the eccentric but brilliant detective, the bumbling constabulary, the first-person narration by a close personal friend. Dupin also initiates the storytelling device where the detective announces his solution and then explains the reasoning leading up to it. Like Sherlock Holmes, Dupin uses his considerable deductive prowess and observation to solve crimes. Poe also portrays the police in an unsympathetic manner as a sort of foil to the detective. The character helped established the genre of detective fiction, distinct from mystery fiction, with an emphasis on the analysis and not trial-and-error. Brander Matthews wrote: "The true detective story as Poe conceived it is not in the mystery itself, but rather in the successive steps whereby the analytic observer is enabled to solve the problem that might be dismissed as beyond human elucidation." In fact, in the three stories which star Dupin, Poe created three types of detective fiction which established a model for all future stories: the physical type ("The Murders in the Rue Morgue"), the mental ("The Mystery of Marie Rogêt"), and a balanced version of both ("The Purloined Letter"). Fyodor Dostoevsky called Poe "an enormously talented writer" and favorably reviewed Poe's detective stories. The character Porfiry Petrovich in Dostoevsky's novel Crime and Punishment was influenced by Dupin. 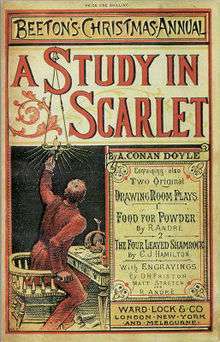 In the first Sherlock Holmes story, A Study in Scarlet (1887), Doctor Watson compares Holmes to Dupin, to which Holmes replies: "No doubt you think you are complimenting me ... In my opinion, Dupin was a very inferior fellow... He had some analytical genius, no doubt; but he was by no means such a phenomenon as Poe appears to imagine". Alluding to an episode in "The Murders in the Rue Morgue", where Dupin deduces what his friend is thinking despite their having walked together in silence for a quarter of an hour, Holmes remarks: "That trick of his breaking in on his friend's thoughts with an apropos remark... is really very showy and superficial"; nevertheless, Holmes later performs the same 'trick' on Watson in "The Adventure of the Cardboard Box". Dupin next appears in a series of seven short stories in Ellery Queen's Mystery Magazine by Michael Harrison in the 1960s. The stories were collected by the Publishers Mycroft & Moran in 1968 as The Exploits of Chevalier Dupin. The stories include "The Vanished Treasure" (May 1965) and "The Fires in the Rue St. Honoré" (January 1967). This collection was subsequently published in England by Tom Stacey in 1972 as "Murder In The Rue Royale" and included a further five stories written since the original publication. Dupin had considerable impact on the Agatha Christie character Hercule Poirot, first introduced in The Mysterious Affair at Styles (1920). Later in the fictional detective's life, he writes a book on Edgar Allan Poe in the novel Third Girl (1966). The Man Who Was Poe, a juvenile novel by Avi, features Dupin befriending a young boy named Edmund. The two solve mysteries together in Providence, Rhode Island. Dupin is revealed to be Edgar Allan Poe himself. Novelist George Egon Hatvary uses Dupin in his novel The Murder of Edgar Allan Poe (1997) as detective and narrator. Dupin travels to America to investigate the circumstances of Poe's mysterious death in 1849. In the novel, Dupin and Poe became friends when Poe stayed in Paris in 1829, and it was Poe who assisted Dupin in the three cases about which Poe wrote. Hatvary writes that Dupin resembles Poe, so much so that several people confuse the two on first sight. Dupin makes a guest appearance in the first two issues of Alan Moore's The League of Extraordinary Gentlemen, Volume I (1999) comic book, helping to track down and subdue the monstrous Mr Hyde (who is living secretly in Paris after faking the death described in The Strange Case of Dr Jekyll and Mr Hyde). The search for the "real Dupin" is at the center of Matthew Pearl's novel The Poe Shadow (2006). Dupin makes an appearance, alongside Poe himself, in the novel Edgar Allan Poe on Mars (2007) by Jean-Marc Lofficier & Randy Lofficier. In Murder in the Madhouse (1935), the first of Jonathan Latimer's series of screwball crime novels starring detective William Crane, Crane presents himself in the sanitarium as C. Auguste Dupin. The story contains more oblique references in the form of stylistic elements (offstage murders, Crane's theories of deduction) that suggest Poe had an influence on Latimer's writing. Dupin is the hero of Les ogres de Montfaucon by Gérard Dôle (2004), a collection of thirteen detective stories set in the 19th century, the last of which (« Le drame de Reichenbach ») also provides a link with Sherlock Holmes. The Black Throne by Roger Zelazny & Fred Saberhagen – a novel about Poe which has an appearance by Dupin. The Work of Betrayal by Mario Brelich – Dupin investigates the mysterious case of Judas Iscariot. Jorge Luis Borges pays homage to Poe's Dupin in "Death and the Compass", by calling his main detective character Erik Lönrott an "Auguste Dupin"-type detective. This is one of the stories published by Borges in his Ficciones(1944). Borges also translated Poe's works into Spanish. A Pierre Dupin appears in Universal Pictures' 1932 horror-mystery film Murders in the Rue Morgue. The Mystery of Marie Roget was also filmed in 1942. Dupin (played by Joseph Cotten) is a character in the 1951 Fletcher Markle film The Man with a Cloak. Dupin's true identity is revealed at the end of the film to be Poe himself. In the comic series Batman Confidential, the creation of Batman's crime-solving super-computer which is linked to Interpol, FBI, and CIA databases is introduced. Commonly known as the "Bat Computer," it is originally nicknamed "Dupin," after Batman's "hero." 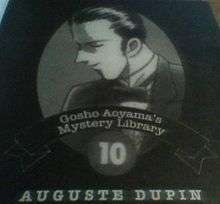 Dupin was highlighted in volume 10 of the Detective Conan manga's edition of "Gosho Aoyama's Mystery Library", a section of the graphic novels where the author introduces a different detective (or occasionally, a villain) from mystery literature, television, or other media. C. Auguste Dupin is the protagonist of the "Dark Tales" Hidden Objects series, developed by ERS Game Studios, published by Bigfish Games. In volume seven of A Series of Unfortunate Events, Count Olaf disguises himself as "Detective Dupin" in order to falsely accuse the protagonists of murder. Conan Doyle, Arthur. "Chapter 2: The Science of Deduction". A Study in Scarlet. Frank, Frederick S.; Magistrale, Anthony (1997). The Poe Encyclopedia. Westport, CT: Greenwood Press. ISBN 0-313-27768-0. Garner, Stanton (1990). "Emerson, Thoreau, and Poe's 'Double Dupin'". In Fisher, Benjamin Franklin IV. Poe and His Times: The Artist and His Milieu. Baltimore: The Edgar Allan Poe Society. ISBN 0-9616449-2-3. Hutchisson, James M. (2005). Poe. Jackson: University Press of Mississippi. ISBN 1-57806-721-9. Knowles, Christopher (2007). Our Gods Wear Spandex: The Secret History of Comic Book Heroes. San Francisco: Weiser Books. ISBN 1-57863-406-7. Meyers, Jeffrey (1992). Edgar Allan Poe: His Life and Legacy (Paperback ed.). New York: Cooper Square Press. ISBN 0-8154-1038-7. Phillips, Mary E. (1926). Edgar Allan Poe: The Man. Volume II. Chicago: The John C. Winston Co.
Rosenheim, Shawn James (1997). The Cryptographic Imagination: Secret Writing from Edgar Poe to the Internet. Baltimore: Johns Hopkins University Press. ISBN 978-0-8018-5332-6. Silverman, Kenneth (1991). Edgar A. Poe: Mournful and Never-Ending Remembrance (Paperback ed.). New York: Harper Perennial. ISBN 0-06-092331-8. Sova, Dawn B. (2001). Edgar Allan Poe: A to Z (Paperback ed.). New York: Checkmark Books. ISBN 0-8160-4161-X. Stashower, Daniel (2006). The Beautiful Cigar Girl. New York: Penguin Books. ISBN 0-525-94981-X. Thomas, Peter (2002). "Poe's Dupin and the Power of Detection". In Hayes, Kevin J. The Cambridge Companion to Edgar Allan Poe. Cambridge: Cambridge University Press. ISBN 978-0-521-79326-1. Van Leer, David (1993). "Detecting Truth: The World of the Dupin Tales"". In Silverman, Kenneth. The American Novel: New Essays on Poe's Major Tales. Cambridge University Press. ISBN 0-521-42243-4. Whalen, Terance (2001). "Poe and the American Publishing Industry". In Kennedy, J. Gerald. A Historical Guide to Edgar Allan Poe. New York: Oxford University Press. ISBN 0-19-512150-3.